I've been absent from this little blog of mine for a few days AGAIN and it annoys me so much I can't keep it together. I don't know what it is lately! I need some vitamin D or something..I'm just so lazy and exhausted lately. But I was also gone this weekend with my boyfriend on our annual Christmas trip which I would love to do a recap post on sometime this week! It was so much fun and wonderful to spend consecutive days together. Anyway, always love to come back to Tay & Ash's link up! I appreciate them having me even when I'm not the most consistent blogger in the world (to say the least). Today's prompt is about what the holidays mean to me. Christmas is my favorite holiday, it's my favorite time of year and I love everything about it. Having lost my grandfather on Christmas Eve last year, I try very hard to continue to make the holiday season joyful and meaningful because it's what he would have wanted. I decided to make a list of what I love about the holidays because it seems easier than writing a whole long post :) // the warmth it brings // spending time with loved ones // gratitude // my faith & Jesus // old and new traditions // holiday parties // Christmas trees // dressing up festively // the music! // all.the.food. // giving // volunteering // wrapping gifts // cozy clothes // cooking & baking new/festive recipes // the smell of pine needles // decorating // our annual Christmas trip // shopping for others // making gingerbread houses // mugs with hot drinks // fresh fallen snow // houses all lit up // Home Alone & other holiday movies // hanging (and filling!) stockings // childhood memories I'm reminded of // jingle bells // breakfast on Christmas morning // Christmas plays/specials // advent calendars // urban cities decorated for the holidays // window displays // dreaming about future Christmases with my future children and husband // Christmas sweaters // garland on staircases // Christmas cards // scented candles // big, red sleighs // Santa! 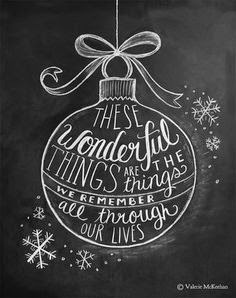 I'm sure there are more things that I'm missing but those are most of my favorite things I love about Christmas! It's hard to describe what is so magical about Christmas but I think one of the best things about the season is it's ability to make everyone feel like little kids again. We get our innocence back and we enjoy the season without skepticism and instead with joy and gratitude. Thanks again to Tay & Ash for hosting! Happy Tuesday, everyone! I'm off to go watch something festive with some popcorn and a hot beverage in tow. This was such a cute post! I agree 10000% on everything you love about Christmas! I love all of those things too. I remember begin done with finals (not too long ago) and how exhausted I was. Take it easy and enjoy your break!! Thanks, love! I can't believe I'm done... and now on to grad school haha. So, you bet I'll be enjoying my break before those classes start!